How do you prevent yourself from morphing into that most heinous of beasts; the cause of boredom? That bore that comes of common complacency, and the bore that you become to yourself when you refuse to use your life for the purpose it was built? Your life was built for your self-expression. If you fail to express yourself – anywhichwayhow you can manage it – you fail at your core purpose. Self-expression and self-esteem are inextricably linked – do not forget that. 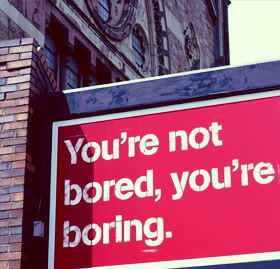 Boring is tiring. It is a decimator. Boring is adhering religiously – yes, religiously – to a certain set of circumspect rules that you allow to govern your life. You should stand up for yourself more. You should stand up to yourself more. We’re tyrants. Each one of us. That is perhaps no comforting thought, but it is fact. When you learn to meet and greet frequently your menace you will find yourself more able – and better-equipped – to face your demons. Demons are in fact not as terrifying as we make them out to be to ourselves. They all have their reasons, they all have a message to share. It is in watching their behaviour(s) that you will find resolution, if you choose to use their (very manageable) resources to your benefit. Again – that choice is up to you. Deny that you have demons and I will laugh. Back to boring. Boredom. A low boredom threshold is not a sign or symbol of a maladjusted human being. It is the sign of someone who will not tolerate mediocrity in either their own lives, or those of the people they allow to influence their days. We all allow someone to influence our days. A friend, a dead someone, an abusive memory made by one of the ego-tamers in our lives. We all meet those – and believe me, we need them. Ego-tamers are like gifts from the gods. Learn to recognise them for who they are and celebrate their attention. Ensure that you do not confuse an ego-tamer with an abuser. They are very different creatures. For someone with a low boredom threshold this blog is so true.